I have been away ( in case anyone wondered!) and have been itching to get back in my little sewing room which I laughingly call the SUGs room. I wanted more rabbits, but these don’t seem as quick to reproduce as the “real” ones, 4 days work and I have 2 new pals. Pippa the party bunny and Gertie the gardening rabbit! I hope you like them, they make me smile anyway! I have been producing white rabbits, not from my hat, but from my sewing machine and work box, and wondered what you thought? They are similar to the soft animals that were made for me when I was a child, many many years ago and I thought it would be lovely to see if I could recreate them! I think I am nearly there now and am happy with the overall result, but they are not made for children of today I am afraid! Their clothes are firmly sewn on and there are little parts, like the carrot in Mrs Rabbits’ pocket that may indeed get eaten. If any one has a bunny type name they would like to suggest, I am open to ideas. 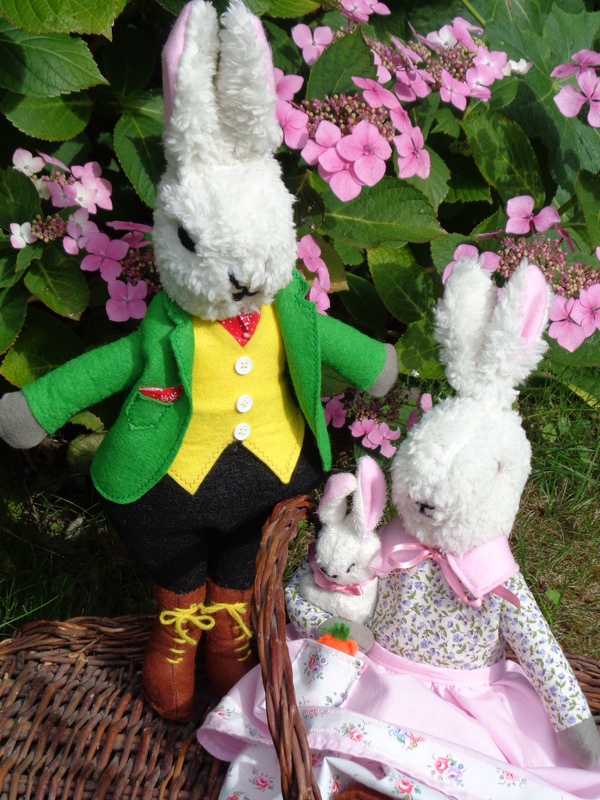 I must add that Mrs Rabbit is a present for my great niece, but I am making mark two as I write this. I have just finished this second beach bag, the first didn’t get a chance to get to the Etsy shop! But this one escaped to have itself launched today. My next job are those outside bench cushions. But first I need a coffee and lunch. Someone whispered in my ear today! 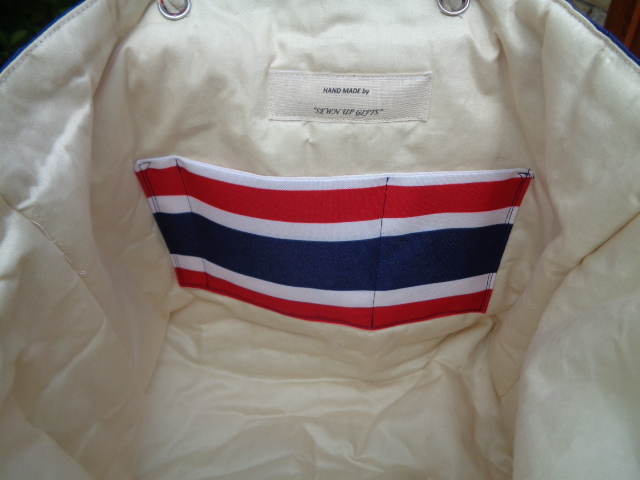 They asked why don’t I make a bag to celebrate the bicentenary of the battle of Waterloo on the horizon in June? What a good idea I thought, now do I have enough time to whip something up, humm. 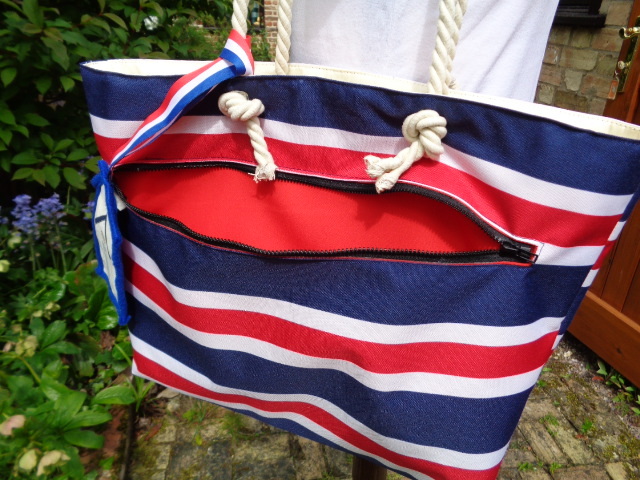 A patriotic beach bag for St George’s Day. Just needs some nice rope handles. Won’t be long before we head off to the sea and sun, this water resistant tote bag should be just the job.